So mommy pulled me aside the other day and informed me that I eat my food just way too fast. Doesn't she understand that I'm a pug? That's what we do...we eat. We have to eat fast, who knows when another treat will come our way? Right pugs? I know you're with me on this one. Mommy stated that she was concerned I can get too "plump" and that I must maintain my girlish figure. So she introduced KONG meals. Now I'm not a stranger to the KONG. Lick and lick and out comes peanut butter, but I hadn't actually eaten a meal this way. I vaguely remember mommy trying to have me eat from a KONG as a young tender pup, but I just really didnt' get it. So now I"m like older and smarter so I have to slooooowly eat out of this device. Don't get me wrong, food is food, but it takes me like 30 minutes and like a lot of energy and I really really really just want to eat it now... Mom says this will make me happy and get some pent up energy out and that I will give her a break...shesh. So I thought I'd give you an update on my votes. I have 160! Thanks to anyone who has voted for me and given to my charity. Just remember a dollar makes a difference, plus no one really needs their uterus right? I'm getting rid of mine next week. Tomorrow mommy is off work, so if the sun cooperates I'll be chillin' in the park. Please think good sunny thoughts for me and I'll do the same for you. Bellatrix! you should tell your mommy to get you a treat dispensing toy for your breakfast it is tons of fun! In the morning when you get breakfast and its like a puzzle! you can find them at petsmart. COngrats on the vote!! 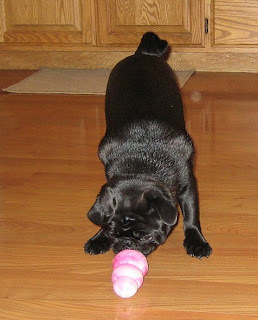 Kongs are awesome my mommy freeze mine and it takes forever to get the peanut butter out!